More Americans should carry naloxone, a drug that can reverse opioid overdoses, US Surgeon General Jerome Adams said Thursday. Amidst the worsening opioid crisis—which killed more than 42,000 Americans in 2016 and even shortened US life expectancy—the federal head of public health has come out with a plea to the public: Learn how to use naloxone, the nasal spray that can reverse an opioid overdose, and carry around as much of it as you can. On Thursday, Surgeon General Jerome Adams issued a public health advisory. In it, he emphasized the life-saving potential of naloxone, which reverses overdose symptoms by blocking and removing opioids from binding to receptors throughout the body. And in addition to calling for doctors and first responders to have more access to the drug, he also recommended that ordinary citizens closest to the crisis become well acquainted with it. “For patients currently taking high doses of opioids as prescribed for pain, individuals misusing prescription opioids, individuals using illicit opioids such as heroin or fentanyl, health care practitioners, family and friends of people who have an opioid use disorder, and community members who come into contact with people at risk for opioid overdose, knowing how to use naloxone and keeping it within reach can save a life,” Adams said in a statement. Adams’ predecessor, Vivek Murthy, similarly stressed the need for naloxone as part of a comprehensive harm-reduction strategy detailed in a 2016 report on opioids. But the Trump administration’s response to the crisis so far has been mixed, experts have said. Alongside widely supported initiatives like greater treatment access for the incarcerated or harsher regulations of the pharmaceutical industry that helped spark the crisis, Trump and his officials have also called for outdated and potentially damaging solutions, including forcing mandatory dose reductions for stable Medicare patients on opioid therapy and seeking the death penalty for drug dealers. Adams himself has seemingly steered clear of any controversies though. Prior to his appointment as surgeon general last year, he served as Indiana’s health commissioner starting in 2014. In that role, he similarly fought for expanded access and availability to naloxone and the creation of needle exchange programs to combat an outbreak of HIV cases aided by wider heroin use (programs that current Vice President Mike Pence infamously avoided supporting at first). And since being appointed, Adams has also pushed for people living with addiction to receive long term support and resources like food and housing. 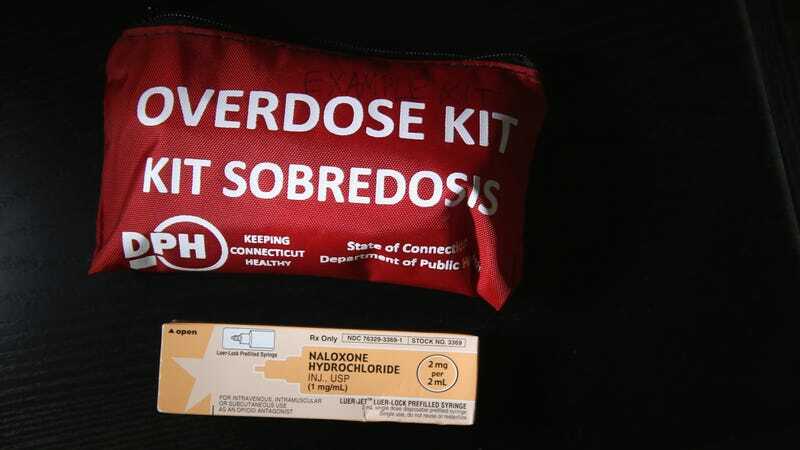 Members of the public interested in obtaining naloxone, which comes in a nasal spray or easily injectable form, should talk with their doctor or pharmacist, learn how to recognize the signs of an overdose (such as slowed or stopped breathing or abnormally constricted, pinpoint pupils), and seek out naloxone training, Adams suggested. It’s estimated that at least 42,000 Americans died from an opioid overdose in 2016—a record-breaking toll—with nearly half of these deaths caused by synthetic opioids such as fentanyl that are much more potent than heroin or prescription painkillers. Over 2 million Americans are estimated to be suffering from an opioid use disorder.